So you’ve made the decision to use one of our Gradus stair nosing profiles for your project and the goods have been delivered. Now what? 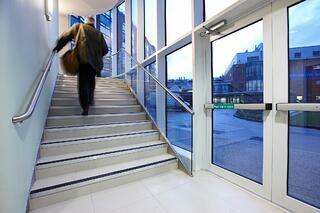 One of the beauties ofour line of stair nosings is the simplicity of installation. 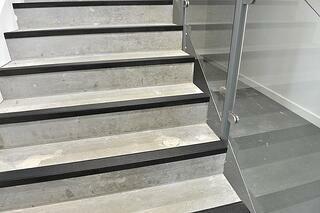 I will go over some of the various stair nosing types and give you step by step instructions. 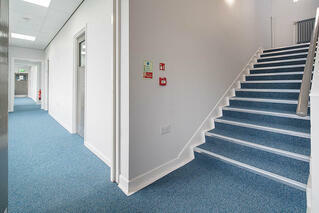 There are some basics that apply to installing any of our stair nosing profiles. 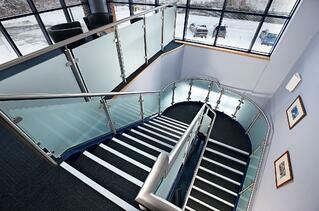 Gradus stair nosings are installed using a general purpose epoxy or contact cement and screws. Make sure that the stairs are sturdy, flat, clean and dry. Measure and cut each stair nosing to the size of your step. It’s easier to start at the top of the flight of stairs and work your way down to the bottom. If you have ordered your nosings pre-cut to the sizes that you need, number them in order of installation. After you have established the order of installation for your stair nosings, it is time to prepare the step. Since we will have already drilled the stair nosing prior to shipping to you, the next steps are very easy. Push the stair nosing firmly on the appropriate step and make a mark on the step through the drill holes. Remove the stair nosing and drill and plug the stair. Plugging isn’t always necessary, but should be done for any concrete step. 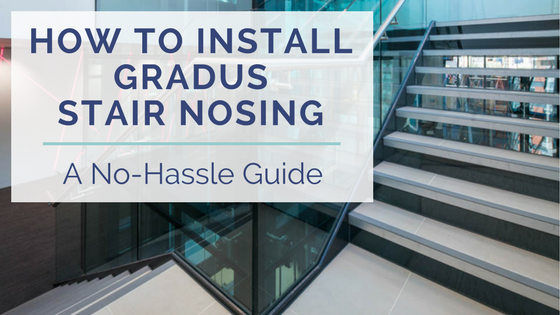 Now, we’ll get into more specific information for different types of Gradus stair nosings. Apply adhesive to the underside of the stair nosing and position on the step. Now you’re ready to screw the stair nosing to the step. After you have screwed the stair nosing firmly to the step, install the plugs to cover the screw heads. Put a small amount of the adhesive that was used for installing the step on the back of the plug and press into place. After completing the above process, your installation will be complete. Note that there are a few exceptions to these instructions in the XT Range. Specifically, CXT1, CXT2, and CXT3 are glue down only. These profiles are not drilled and do not require screwing to the step. This is because of the “lip” on the back of the stair nosing that goes under the flooring product that is on the step*, which helps hold the stair nosing in place. *Typically, ceramic tile is the one used with these profiles. Apply adhesive to the underside of the stair nosing and position on the step. Screw the stair nosings to the step. Make sure that you get the screws flush with the stair nosing before going on to the next step. Cut off a piece of the Elite insert to match your stair nosing. Elite inserts come in coils and you will have to cut them to size. Make sure that you allow a small amount of overage on each end, as the inserts may shrink slightly over time. Peel away the liner from the back of the insert and press into the track of the stair nosing. With Elite profiles, the insert comes with a peel-and-stick adhesive on the back for installation. Be sure to position the insert straight, as it is very difficult to pull the insert up and reposition. Press the insert firmly into place. Apply adhesive to the underside of the stair nosing and press onto the step. Screw the stair nosing on the step firmly. Again, make sure that the screws are flush with the stair nosing. Place a strip of double-sided tape into the track of the stair nosing. * Since, the Traditional inserts do not have an adhesive strip on the back of the insert, we place a strip of double-sided tape into the track of the stair nosing prior to shipping the goods to you. After the stair nosing is secured to the step and your insert has been cut to size, peel off the liner from the strip of tape in the track and press in the insert. Remember, it’s hard to reposition the insert, so make sure you have it straight when you press it in. You now have a completed installation. *This is where the installation of Traditional profiles is handled differently than with the other profiles at Optimum. Make sure that your step is sturdy, clean, dry and flat. Cut the stair nosing to the appropriate size. Apply a generous amount of contact adhesive to the back of the stair nosing and press into place. You will want to start at one end of the step and work your way down the step, pressing firmly as you go, to ensure a good bond between the stair nosing and the step.